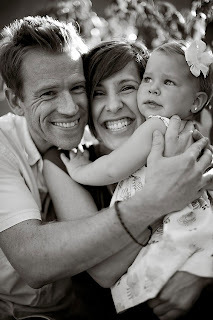 my brother-in-law, his beautiful wife, and my one & only---couldn'tbecuter, niece. we said good-bye to them sunday. i tried not to cry. they are in california right now. destination peru. i'm really excited for them. and excited for us to go visit. they are sensitive, caring, & the best listeners you will ever come across. everyone the meet falls in love with them. so if, after October 21st, you happen to find yourself here, feel free to look up the kliewers. i'm sure they'd love to have you. lindsey might even make you brunch, or salsa, or chocolate covered strawberries. jason would probably make you laugh, or shoot hoops, or just talk. & shelby? well she would just entertain you with her vocabulary & phrases. she knows how to keep her audience pleased. That is sad that they are gone...but what a great ministry they have! Very well said, and very true.